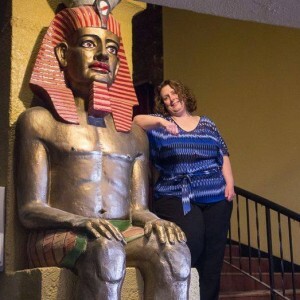 After a nation-wide search using the League of Historic American Theatres, we have hired an exciting and well experienced Executive Director/Theatre Manager for our Egyptian Theatre! Kara Long has joined us from Delaware, Ohio where she very successfully managed the operation of another historic theatre, The Strand, as Chief Operating Officer and Executive Director for the last 12 years. In addition to over 17 years of direct management experience in theatres like our Egyptian, she has worked as an office manager in various financial and real estate organizations and attended Ohio State University. 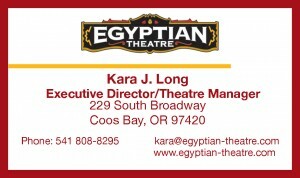 Kara officially started managing our theatre the day after Memorial Day – in time for our Grand Re-Opening! I learned the art of managing a historic theatre not in classrooms but in a 1916 cinema. I was not taught by professors knowledgeable in the theory of management but by a Greek immigrant who learned to speak English by watching movies while running the projectors. He learned how to promote and exhibit motion pictures from the folks who promoted and exhibited films like Gone with the Wind and Wizard of Oz. During the heyday of movie going in American culture, it was the theatre manager’s job to promote and excite their community for the upcoming motion picture. I have that knowledge in me. It oozed into my pores at the age of 16 as did the ability to strike a carbon arc, do a change over and buildup 2000’ spools of 35mm film into the feature that everyone was just waiting to see. This is what I bring to you from Ohio. That one line sums up why I do what I do: to hear an audience laughing, screaming, singing or clapping is what keeps me coming back for more each day. I am excited about some upcoming movie and live events planned for this summer. Date Night Friday Nights, Family Fun Saturday morning movies, Classic Sunday’s, Beer and Movie Nights, Pajama Parties and much more. Our Saturday morning movies will have free admission in exchange for a local charity donation, so everyone will benefit. I am looking forward to meeting you all at the movies. I bring with me from the Buckeye State, my wonderful partner in life, Steve Leibrand and our 3 dogs. Na-La a 10 year old Chinese Shar-Pei, Butters a 7 year old Chinese Shar-Pei and Gru , a 4 year old, who is a Shar-Pei/Bird Dog/Who Knows What else. Gru is my failed foster-dog, before Gru and his brother came to stay with me I had fostered dozens of puppies, dogs and kittens. We are looking forward to meeting all of you and getting to know the area. We will love to hear all the best places to take pictures and walk dogs on the beaches. See you at the Egyptian!